Boconnoc can trace its history back to the Normans and its first recorded owners were the de Cant family (1268). In the 14th century, the estate passed to the Carminows, of whom Sir Oliver married a grand-daughter of Edward I. In 1579 the house was sold to Sir William Mohun. The Battle of Braddock Down was fought near here during the Civil War (1642-1646) and the house was one of Charles I's strongholds at this time. Towards the end of the 17th century, Thomas Pitt, Governor of Madras and grand-father of the Prime Minister William Pitt, purchased the estate and greatly modernised it. 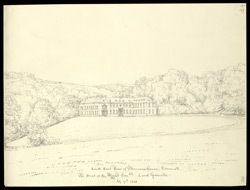 At the time of Buckler's visit, the house was the residence of Lord Grenville.